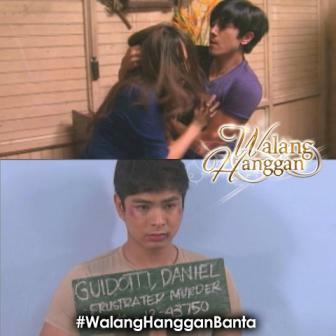 Tonight's episode of the country's phenomenal hit TV series "Walang Hanggan" gets more intense! The character of Coco Martin as Daniel and Paulo Avelino as Nathan involve in another brawl! After Nathan discovered the place where Katerina (Julia Montes) is hiding, he gets brutal to her wife. Daniel witnessed the situation and defended Katerina against Nathan. But in the end, Daniel will be imprisoned! Can Daniel surpass this another trial in his life?! On the other side, what then will happen to Nathan and Katerina now that Nathan found out that their wedding was null and void? !